Let me tell you a story of intrigue, submarines, cables, money, and bravado. Western media outlets have been heavily publicizing the threat posed to The West from the Soviet, I mean, Russian Navy. Most (probably all) do not provide any additional analysis of the numbers of ships or submarines deployed, or historical numbers to compare with, to characterize the threat that is being claimed to exist. I don't know why that is. Is it a lack of experts that are willing to analyse the statements critically or objectively? Let me introduce you to Russian Admiral Vladimir Korolyov. The Russian Navy is undergoing a major rebuild after being significantly neglected during the fall of the Soviet Union. The Russian Navy is a particularly proud institution, with a long history, and great pride in their fleet, even if some of it is a little rusty, and have a sorted safety record. Coming from that angle, every advance or achievement they make is boasted about with significant fanfare; sometimes more than it deserves. Russian Admiral Vladimir Korolyov stated, in 2016, Russian Navy submarines, in all the world's oceans, spent 3000 days at sea. "Days at sea" is the metric used to measure a country, or ships's, naval presence. It's the same metric as has been used for decades. Wiggle room in that statistic can be provided by adding or subtracting patrols in "home waters". The CIA metrics used during the Cold War had to do with Russian Navy vessels being deployed outside "home waters", like the Indian Ocean, Atlantic Ocean, Caribbean, etc.. so that's the comparison we can make for context. 3000 days? That's a big number! How many submarines is that? Well, number of submarines isn't the same thing. We have to account for 3000 days at sea, with 365 days in a year, and only a bit of other data to work with. Submarines come in whole pieces, a half a sub wouldn't work very well, so lets say 9 submarines, for almost all 12 months each would make 3000 days at sea. However, 9 submarines is unlikely, since submarine patrols are usually less than a year. Maybe ~17 submarines for 6 months each (3102.5 days). 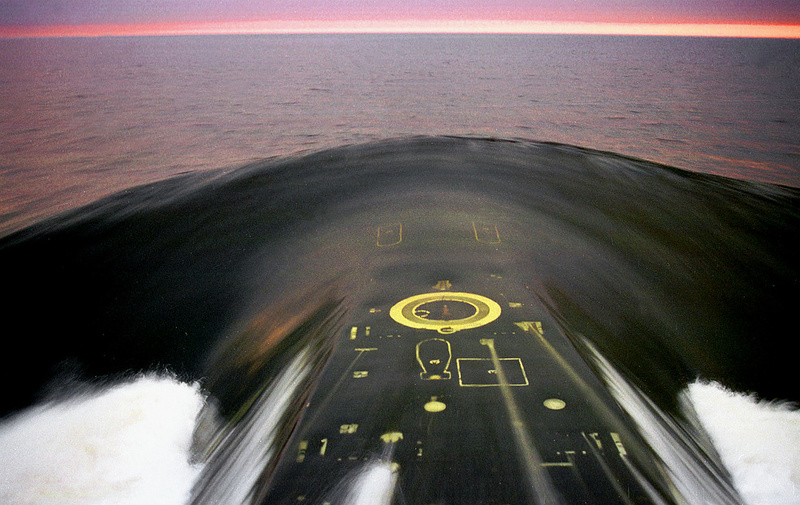 But, once again, we have a little wrinkle; the 3000 days at sea is referring to *global* submarine deployments. While I feel a lot of the Russian focus has been about the Atlantic, perhaps because of NATO, those ~17 submarines were spread across the Pacific, the Atlantic, and the Mediterranean. To get to the Mediterranean, Black Sea submarines could deploy or Northern Fleet submarines, transiting through the Atlantic, through the English Channel, and through the Strait of Gibraltar to get there. Realistically, it's most likely a mixture of shorter and longer deployments, but I'm trying to give an impression of the actual real numbers of submarines that are being discussed without using hyperbole. Declassified CIA documents from 1985 identify their assessments of the strength of the Russian submarine force at the time, globally; that number is ~15,000 days. Yes, that would mean the 2016 Russian Navy 3000 days-at-sea would equal 20% of the deployed strength of the Soviet Navy in 1985. 20%? Yes, 20%. Can you see why the Russian Navy Admiral didn't come out and say "we're finally at 20% of the strength we were once at, huzzah!". That's not the story of strength he's looking for. Likewise, can you see why neither the US Navy or NATO MARCOM came out and said "Oh that's cute, they're at 20% of what they were! They're a "threat! "; ha-ha". That wouldn't really bolster military naval spending on expensive new defence programs, like upgrades to the IUSS (you remember, the new SOSUS) which seem to be presently underway. Presently, the Russian Navy submarine fleet sits at 70-something vessels, including stretch-variants that act as "mother-ships" for small special purpose "spy" submarines, across all the fleets (Pacific, Atlantic, Black Sea, Baltic). That's a hard limit. They don't have more than that. You can assume they're not all available for Atlantic Ocean deployments as well. Of those 70-something, several are undergoing refit, are laid up for fire fighting training in Vladivostok, or other activities that prevent them from sailing. If the number deployed in the Atlantic 7 years ago is n, the level now is 10*n according to the Honourable Minister, right? 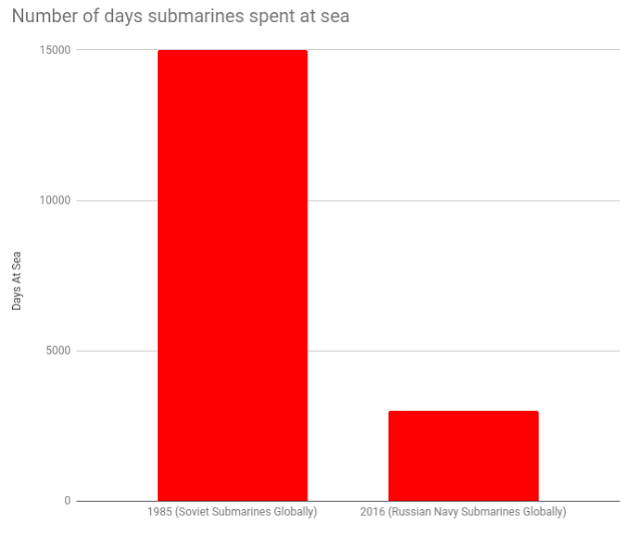 Knowing there has to be a whole submarine, we know the number of submarines seen in the Atlantic was, in 2010, a whole number between 1, and less-than 10 times that number now, while keeping the number under what is deployable to the Atlantic. The number of deployable submarines is guessable via OSINT, but we'll just say well less than 70. 10 submarines in the Atlantic last year? Possible, but seems low. 20 submarines in the Atlantic last year? I think that's likely. 30 submarines in the Atlantic last year? 30 submarines would have to have been on very short patrols in order to work into the 2016 ~3000 day number, and is likely the absolute maximum number of submarines that would be able to deploy in the Atlantic from a geographic availability point of view. Do you see anything wrong yet? That's way too many words and math to keep most people's attention. The Honourable MP stated (caps for effect) "TEN-FOLD INCREASE" over the past 7 years. That might be accurate, but is also a misleading statement, to sensationalize the otherwise unremarkable statistics portrayed by the numbers. Telling the House of Commons of the United Kingdom that the Russian Submarine presence in the North Atlantic is 1/5th of what it was during the Cold War probably doesn't have the same sort of budgetary shock and awe as saying a "ten-fold increase" over seven years. This is true, but extremely misleading. By the end of the Cold War there were no submarine patrols, the Soviet Union was broke, and their subs didn't have the diesel to go anywhere. So yes, today, any day, the Russian Navy is operating at a higher tempo than the end of the Cold War, and dissolution of the Soviet Union. It's a truism once you know what the "levels" and time period they are referring to. It gives everyone what they want; the Russians fluff their egos, while NATO members fluff their budgets. "Russian, American, and NATO statements agree that Russian Navy submarines are deployed in the Atlantic for an amount that is less than 20% of what they were during the Cold War, using days at sea to accurately compare their levels of deployment. The UK Defence Secretary stated in 2010 they may have fielded only 2 subs, and in 2017 they may have fielded ~20 in the Atlantic, for various durations." That statement is as true as I can make it based on the available information, and can be independently fact-checked with open source methods. Don't believe my analysis? Well it lines up pretty closely with what author and renowned expert on all things covert and submarine, HI Sutton, said in his analysis. While Mr Sutton has a different take on the numbers, I believe his research shows the statements made by NATO members have been disingenuous and could have been much more clear. You can read his analysis here and see if you think our facts line up. To be absolutely clear, I am not against the UK, or American militaires increasing their military budgets for a perceived threat; I'm against marketing to, and fooling, the public; especially misleading them with shady math.